White crappie (white perch); photo by Hunter Desportes on Flickr (use permitted with attribution). 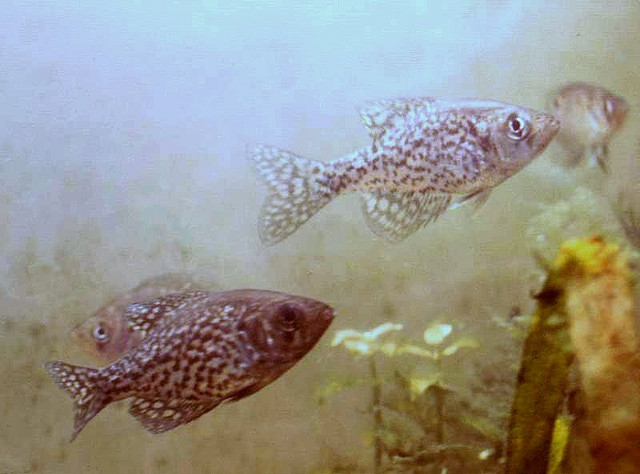 The white perch (pomoxis annularis) was designated the official freshwater fish of Louisiana in 1993. Also called sac-au-lait, white crappie, speckled perch, papermouth, goggleeye, silver bass, and bachelor perch, the white perch is a schooling fish in the sunfish family. Males dig a nest in sand or gravel under 3-10 feet of water and then lure females in to mate. Females lay a few fertilized eggs in several male nests, distributing genes more widely. Their range is patchy throughout the USA and southern Canada, heaviest in the Mississippi river system. Size - typically 1-2 pounds, but can grow to nearly 7 pounds.